SENDAI (Kyodo) The Yayoi people, who are believed to have migrated to Japan from other parts of Asia via the Korean Peninsula, may have moved north through the Japanese archipelago much faster than previously believed, according to Tohuku University researchers. The researchers made this claim based on examinations of four corpses dating from the Yayoi Period (the fifth century B.C. to late third century) that were unearthed in Naruse, Miyagi Prefecture, at the Satohama shell mounds. The remains had dental characteristics of the Yayoi, the researchers said, and were discovered along with broken pieces of earthenware dating from the mid-Yayoi Period about 2,000 years ago. According to conventional archaeological theory, the Yayoi displaced Japan's neolithic Jomon people in western Japan by the third century B.C., but did not spread to the Tohoku region until the late eighth century A.D., when Sakanoue no Tamuramaro (758-811) was ordered by the Yamato court, which ruled most parts of the country, to conquer the region. The Yayoi are believed to have settled in many parts of northern Kyushu and western Japan, displacing the Jomon, while they intermingled with the Jomon in the Kanto Plain. In Hokkaido and the Tohoku region, the Jomon were believed to have been unaffected by the Yayoi, who brought rice cultivation and the use of bronze and iron to the archipelago, it said. The Tohoku researchers' findings, however, suggest that at least some Yayoi may have settled in the northern region much earlier. According to the Naruse Municipal Board of Education, which was in charge of the shell mound dig, all four corpses were of children between the ages of 2 and 3. Their gender is unknown. The remains were buried in pits at a site 5 meters in diameter, and the area could be a burial site for children, board officials said. The municipal board of education asked Takashi Nara, of the Tohoku University medical school, and Toshihiko Suzuki, of the university's dental college, to examine the corpses. The researchers found that their teeth were larger than those of the Jomon and they had hollows in the back of their front teeth - typical characteristics of the Yayoi. These characteristics were found in remains of Yayoi found in northern Kyushu and at the Doigahama Ruins in the town of Hohoku, Yamaguchi Prefecture. 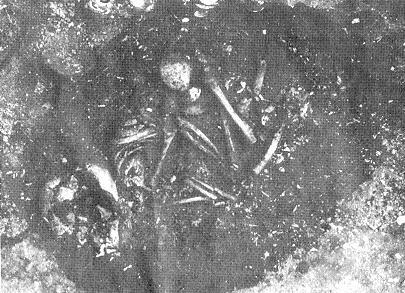 The remains of about 300 Yayoi have been unearthed at that site. The researchers said the remains found at the Naruse shell mounds had apparent visible differences from other remains taken from the same site, which were human bones from the Jomon Period. "The fact that four corpses were found at once indicates a strong possibility that the Yayoi formed a community there," Nara said. The researchers' report on the corpses will be unveiled at the general meeting of the Japanese Dissection Society slated for March in Tokyo. Archaeologists have discovered early Yayoi ruins of rice paddies in present-day Hirosaki, Aomori Prefecture, proving that Yayoi-style rice cultivation spread through northernmost Honshu. However, they have only found Jomon earthenware and religious instruments.